We have posted about the vagaries of the US Postal Service before (see Theo Theokitos, Valued Feline Postal Service Customer http://wp.me/p4uyM6-I and Mr. Gregory Shreve, Official Starfleet Officer http://wp.me/p4uyM6-F ). In this post we return to the topic of the USPS, an organization that can, apparently, engender a multitude of amazing stories for us to recount. We come to you now with a new fable, an absurd adventure of misdirected packages, wandering mail carriers, disinterested postal supervisors, gracious neighbors, and a vanished internet feline. The story begins with Joan. As you read in our last post, we are currently without a (real, live) cat. This has led to some adjustment problems on our part (including the disconcerting habit of seeing apparitions of dearly departed felines around the house out of the corners of our eyes). One particularly difficult adjustment for Joan (which we can label “cat on the bed syndrome”) has been going to sleep at night without a cat lying nearby or, preferably, snuggled close. While it is, of course, obvious that no home should be without a cat or two or more, we have decided, for the time being, that bringing a cat into our household would be difficult. Now that we are both retired, we are traveling frequently. Just in the last four months we have traveled to Eastern Europe, South Carolina, Oregon, and the Canary Islands off the coast of Africa. At this point in our lives, we would find ourselves leaving our cats alone for long periods of time. With no real cat to comfort her at night anymore, Joan began sleeping with a large stuffed tiger by her side who goes by the name of Jade, a gift from our children years ago. However, Jade, a giant among its kind, is at least three feet in length and threatened to dispossess the bed of its other long-time occupant, Greg. When she would awake in the middle of the night, Joan would find, much to her annoyance, that Jade had mysteriously been removed from her side and placed at the bottom of the bed. A smaller bed companion apparently had to be found. There were requirements for this new companion: portability, suitability for cuddling, softness and general, all-around, cuteness. These are requirements that Greg, in all honesty, does not fulfill (although he claims other compensating virtues). While trying to locate a birthday gift for our middle daughter, a felinologist at Oregon State University, we ran across a plush toy imitation of internet sensation “Lil Bub” at http://lilbub.com/ and purchased one from the site’s online store. After holding our daughter’s plush avatar of Lil Bub, Joan decided that having one was the best possible cure for her syndrome. Your Lil Bub order has shipped via United States Postal Service! But, we were confident. The United States Postal Service, respected branch of our federal government, had custody of our little cat. They would take care of her, surely. Our fears were more than allayed when we read from the tracking application that Lil Bub had been delivered securely right to our front door on Friday, January 2nd as promised! Exactly at 2:43 pm! We went outside to gather her in and tuck her into bed with Joan. Except, except—she was nowhere to be found. Not on the front porch, not on the side porch, not laying in the yard, or on the back stoop. She was gone, vanished. Thinking she might appear miraculously over the weekend when our mail carrier discovered her fallen behind a bag in his truck or neighbors discovered her mislaid on their front steps, we waited. And then we waited some more. 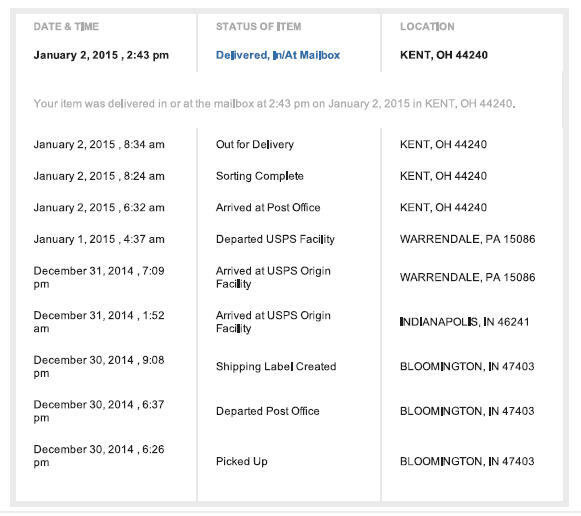 Finally on Tuesday, January 6th Greg drove hopefully to the Kent, Ohio Post Office to inquire about our wayward feline. Once there he waited some more. Here Greg must digress and indulge in a small rant. The Kent Post Office is like the anteroom to Hell. Abandon All Hope, Ye Who Enter Here. There is almost always a wait to buy stamps, ask a question, or procure meaningful postal service of any kind. The wait is engendered by some sort of local policy that prevents the Postmaster from staffing all three of the postal service counters at the same time. One is always closed, even when the line of customers reaches back to the doors. But, as said, this is a digression. We return to the main narrative. After an unnecessarily long wait (45 minutes according to the time stamps from text communications between Joan and Greg), a postal clerk shunted Greg to a supervisor with the words “you’ll have to talk to a supervisor about that.” The supervisor (who shall remain nameless, and deservedly so) deigned to appear after another unnecessarily long wait. He took the tracking information, disappeared again for a while and then returned to indicate that “according to scans” (apparently mail carriers have to check in during their rounds and indicate where on their route they are at a particular time) the mail carrier had not been on North Prospect Street where we reside at the time in question, 2:43 pm. He had been on our street some two hours earlier. This begged the important question: where was Lil Bub actually delivered? The supervisor had no answer, offered to quiz the mail carrier as to Bub’s whereabouts, and said that if she didn’t appear in a few days to submit a postal claim. Greg left with little hope of any resolution. The postal claim might (or might not) produce a refund but would most likely not produce the missing cat! The next day, while blowing snow off the sidewalk, Greg happened to see the mail carrier and raised the issue of the missing package. The mail carrier claimed no specific knowledge and said that the supervisor had not spoken to him about the misdelivered package—but did say, vaguely, that he “might have seen a note about it.” The carrier did say that at 2:43 pm he was most likely on Park Avenue, the next street over. Greg asked him to look for the package but noted a distinct lack of commitment for resolving the problem in the carrier’s response. Then Joan, the one with the memory in our family, brought it to our attention that several times in the past mail had been misdelivered to a house with the same number as ours, but on another street, Chestnut. Maybe the package was there? With hope in our hearts we went to that house and knocked on the door. No packages visible. No answer to our knock. We were stymied again. Another several days passed. Finally, about a week after the supposed delivery, we decided that Lil Bub had gone postal and disappeared forever. Greg ordered a replacement Lil Bub, this time from Amazon since The Bub Store online was temporarily closed for revamping. Our plush would appear, as scheduled, two days later on our doorstep (United Parcel Service) with no problem. The saga of Lil Bub was over. Or so we thought. On Sunday January 11, about nine days from the botched delivery, we decided to go grocery shopping. We turned out of our driveway and proceeded to the intersection of Prospect and West Main. We turned right. A car following us turned right. We went down to the next street, Chestnut, turned right and decided to take another quick look for our missing package. The car following us turned right with us. We passed the house where we suspected our package might be, slowed down, looked, but saw no one at home. We then proceeded to turn right on Bryce. The car behind us turned right on Bryce. Quick on the uptake, we realized were being tailed! Several worst case scenarios flashed through our minds. Still puzzled, we nodded in the affirmative. He exited his car and handed a package containing one plush Lil Bub in through the window and into Joan’s waiting arms. She had indeed been delivered to the house that Joan had suspected all along, but to the rear of the house and not the front. We had knocked on the wrong door earlier. Lil Bub’s savior had thought the package was his daughter’s and had put it aside until she came home after the New Year. Mystery solved (although why this never occurred to our mail carrier is beyond us). Lil Bub came home with Joan. That evening her twin, the replacement Lil Bub, also appeared. We now had a surfeit of Lil Bubs. Interestingly, this overabundance of Bubs seemed not to bother Joan at all. Quite the opposite. Both now reside in and on our bed and have been renamed Lille (Norwegian for “Little”) and Katt (Norwegian for “Cat” in honor of Holly Golightly’s feline friend). All is right with the world. What was lost is now found, thanks to a gracious neighbor and good fortune. 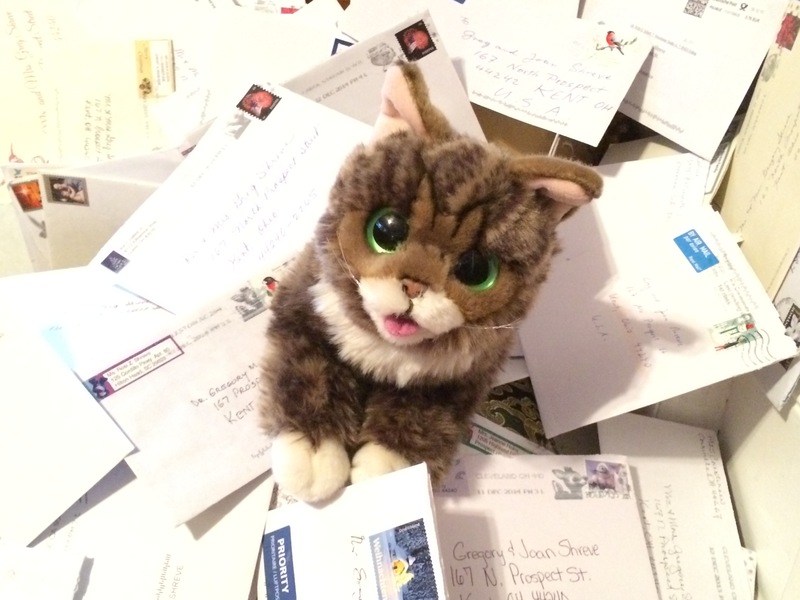 No thanks to the United States Postal Service and our local Post Office who had, quite obviously, been content to let Lil Bub go postal. We encourage you to visit Lil Bub at http://lilbub.com/ to read about this real-life precious cat. A portion of all purchases at The Bub Store goes to a fund for special needs pets. It is a site worth supporting. Love the tale, what an adventure… I have a rescue cat and dog don’t know what life would be like without them. Ah, the USPS. Whenever I am sent a package via that wonderful organization and view their tracking information, it is often lacking in specifics. I can only gaze at my mailbox and wait wistfully. I am happy that your twins are with you. One of cats, Freddie, who adopted us (a long story), sleeps either on my pillow, by my side, or on my feet at night. How wonderful it is to have a bundle of motorized fluff with you at night. I hope that someday you will have another cat, or two, or more. Life is too short not to be without such close and loving friends.